In Who Gets What - and Why, Nobel laureate Alvin Roth reveals the matching markets hidden around us and shows us how to recognize a good match and make smarter, more confident decisions. 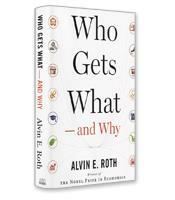 In his new book, Who Gets What — and Why, an engaging exploration of the different types and different roles of matching markets that underpin how our world operates, Roth devotes a full chapter to the creation and expansion of NEPKE — a market that does not involve money since the sale of kidneys is illegal and has been expanding thanks to the continued evolution of its rules. Rules are at the heart of market design, the discipline for which Roth is perhaps the world’s most pre-eminent expert. Politicians talk of free markets as if no rules are necessary, as if self-interest and self-control will ensure the efficiency of markets. But as Roth shows through his many examples, rules are necessary because markets only work under the right conditions. For example, markets need to be thick — there must be a sufficient number of buyers and sellers all active at the same time for the market to work. The kidney exchange works because a sufficiently large database of donors and patients was created. At the same time, markets cannot be too congested. Buyers need to be able to find what they want in the market in a timely manner. Travelers using Airbnb, which created a market of rooms in personal homes acting as hotel rooms, were hampered by the response time from hosts using personal computers. Smartphones (hosts no longer had to wait to check their computers at home at night) relieved the congestion. Markets also need to be safe: Both buyers and sellers must be assured that they will not be cheated. One of the challenges of Uber was convincing travelers that the car would show up and convincing Uber drivers that passengers would wait. Markets that are not thick, uncongested or safe will unravel and no longer fulfill their functions. Packed with fascinating stories, from the history behind the nickname Oklahoma Sooners to the role that repugnance plays in market design, Who Gets What –– and Why is at once supremely insightful and entertaining — a rare combination for an economics text.